Sliding Screen Doors Westlake Village Service | Screen Door and Window Screen Repair and Replacement Simi Valley, Thousand Oaks and Surrounding Areas. Sliding Screen Doors Westlake Village repair and replacement mobile screen service offering free estimates for all customers calling us for sliding screen doors issues. Econo Screens specializes in sliding screen door repair of all types. Our quality sliders are strong and custom made to fit perfect on any size and shape opening. 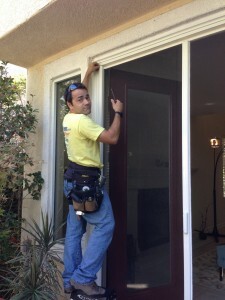 Our screen technicians are trained in custom installs and are pros at getting the job done right. From measuring to final screening and latch trying our company is ready to serve you. Please call us today for your free estimate! This entry was posted in Screen Doors Westlake Village, Sliding Glass Door Repair and tagged Sliding Screen Doors Westlake by Econo. Bookmark the permalink.